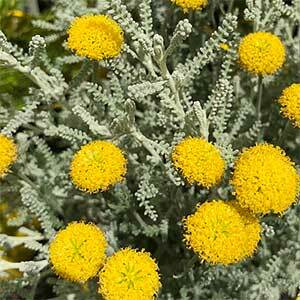 Aromatic silvery grey foliage and bright yellow button like flowers make Santolina chamaecyparissus a great cottage garden or low edging plant. The common name is CottonLavender, and with soft downy foliage and being evergreen this is a useful plant in a sunny position in any garden. Suited to Mediterranean style gardens, sunny well drained soil and also being very low care this no fuss plant has many uses. When in flowers the bright yellow flowers contrast well against the grey foliage. It can be mass planted with a great effect as well as low maintenance. Plant Santolina chamaecyparissus in a well drained humus rich soil. It will grow in full sun as well as a little shade, however is nor suited to deep shade. Water well after planting and lightly mulch to maintain some moisture. Once established this is a plant that will rarely require any watering at all. Maintenance is limited to pruning, and this is a plant that responds well to a regular cut back. The best time to prune is in spring, this gives the plant time to put on good new growth. In warmer climates, you can also prune in late summer. If you need to hard prune, do this in spring as for other Santolina varieties. Some gardeners grow this plant for the foliage, so will prune away the yellow button flowers as they emerge. Foliage – Deep silvery grey. Flowers – Small yellow buttons. Pruning – Prune in spring or late summer.